Immerse yourself every day in the immensity of the ocean, and the fifty shades of blue of one the most beautiful Caribbean lagoon. 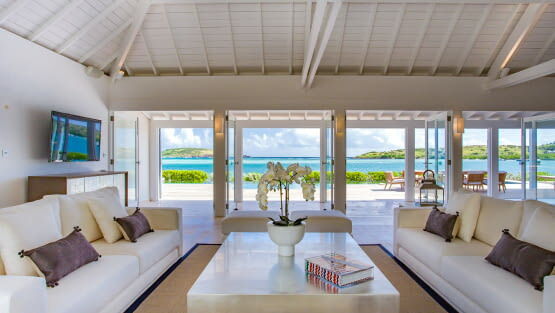 Villa AQUA is the perfect blend of contemporary luxury and pure design. 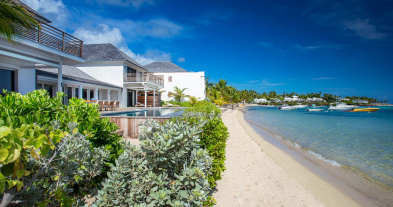 Elegant Villa AQUA is a unique beachfront villa situated directly on the turquoise lagoon of Grand Cul de Sac, with private beach access – steps from those warm cerulean waters – complementing the extra-long infinity pools with sweeping views of the sea. Breathtaking views of the lagoon are the first to seduce guests. 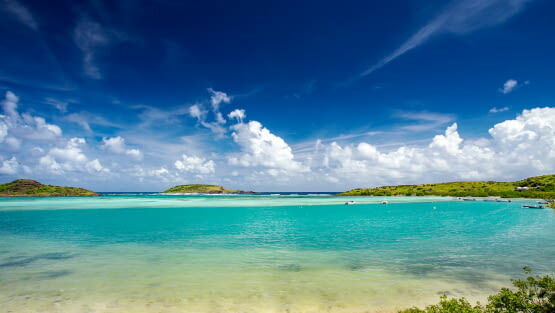 Stepping out onto the warm sand and diving directly into her blue green magic comes next. Outdoor living at Aqua is premium, with large sunny terraces, laden with cozy sunbeds and outdoor dining, all at the water’s edge. A fantastically spacious living room includes a dining area that open via a bank of French doors to the pool deck and outdoor living space. Indoor dining and a well-equipped gourmet kitchen provide further convivial shared space for animated gatherings with friends and family. The six en suite bedrooms include four beautiful guest suites located on the main floor on the beachfront level and two upper level master suites towering above spectacular seascapes and providing divine amenities that include a dressing room, a private balcony and a living area. Located just next to one of the most luxurious 5***** Hotel & Spa, guests can easily enjoy the many perks and pleasures of proximity to a world-class luxury hotel. That is, if you can pull yourself away from the many comforts of the villa itself. Proximity (walking distance) to two casual restaurants, the bars and dining venues of three 5 star hotels, and watersports rentals are a "location-bonus". 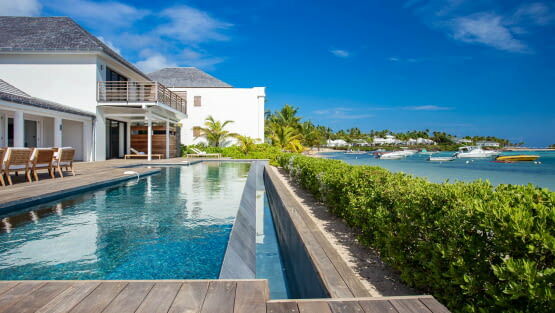 Villa AQUA can be rented with its twin Villa BLEU for a total of 12 bedrooms. Air conditioned indoor large Living Room, HDTV, French Satellite, Dish Network, Apple TV, Indoor dining room for 12 people, Service for 24 people, Ocean view. Fully equipped Kitchen, Electric oven, Gas stove, Microwave, Fridge, Freezer, Ice Maker, Dishwasher, Coffee Machine, Nespresso Machine, Blender, Electric Kettle, Electric Juicer, Toaster, Pantry especially for a private chief, Second Fridge and Wine Cellar, Air conditioning, Ocean view. 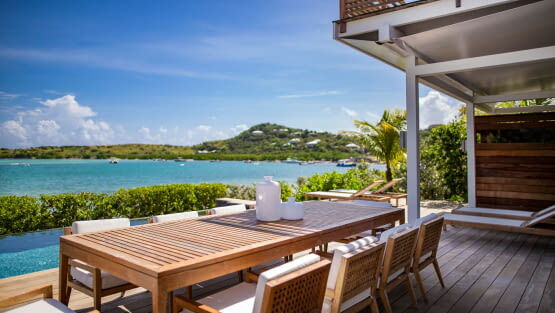 King size Bed, Dressing, Ensuite Bathroom with Bath, Shower and double sinks, Small lounge, Safe, Office space, HDTV, Dish Network, Sonos Sound System, Air conditioning, Pool and Beach towels, Welcome products of La Ligne de St Barth, Private terrace, Deck chairs and Outdoor Lounge, Ocean view. 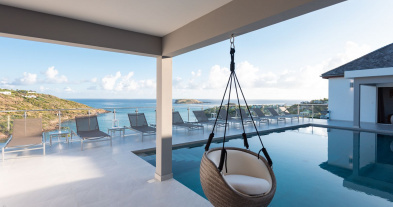 King size Bed, Ensuite Bathroom with Shower and outdoor Shower, Closet, Air conditioning, Safe, HDTV, Dish Network, Sonos Sound System, Pool and Beach towels, Welcome products of La Ligne de St Barth, Private Terrace and decks chairs, Direct access to the pool, Ocean view. 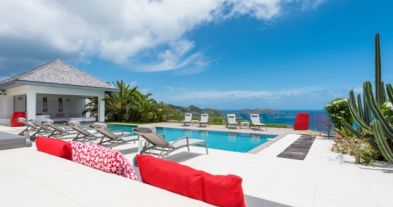 Twins Bed, Ensuite Bathroom with shower and outdoor Shower, Closet, Air conditioning, Safe, HDTV, Dish Network, Sonos Sound System, Pool and Beach towels, Welcome products of La Ligne de St Barth, Private Terrace, Outdoor table and chairs. Infinity Pool surrounded by a spacious Sunny Terrace, Outdoor dining space and a table for 10-16 people, Gas Barbecue, Ocean and Beach view.